Cyberview Sdn Bhd brought home the Movers & Shakers Award from the 2018 Asia HRD Awards for their amazing efforts in transforming the workplace culture at Cyberview. The prestigious event that took place at Ho Chi Minh City, Vietnam recognises its managing director, Mohd Najib Ibrahim for his outstanding work towards transforming Cyberview as a high-performance organisation. 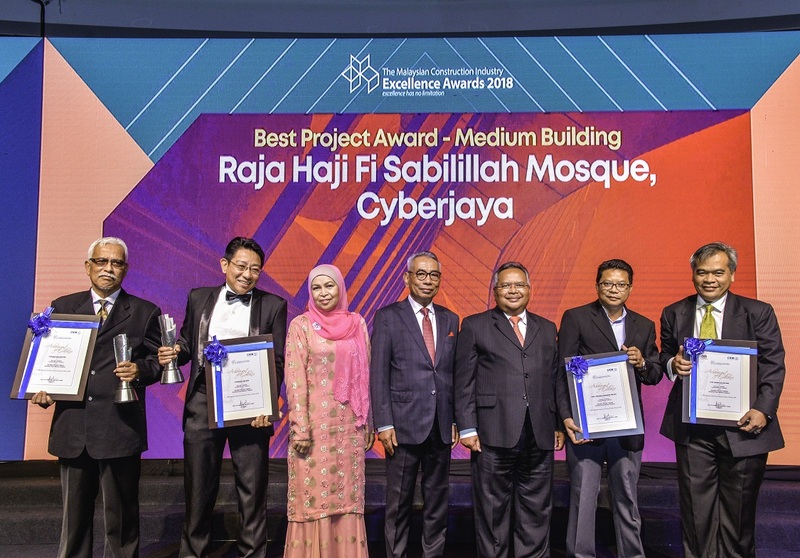 Cyberview Sdn Bhd was recognised by the MCIEA for the Best Project Award in building the Raja Haji Fi Sabilillah Mosque, the first mosque with a Platinum Rating in Cyberjaya, Malaysia. The report explores the increasing convergence of network and IT functions within CSPs as a critical part of digital transformation, and the challenges facing CIOs and CTOs as a result. Based on the responses from global CTIOs over the course of six months, the report concludes that a single technology strategy is required to bring together all network and IT functions successfully. Delivery through a one leader is also essential. The Consumer Technology Association (CTA™) is recognizing LG Electronics (LG) for its groundbreaking innovations in technology and design with CES 2019 Innovation Awards – led by Best of Innovation wins and multiple honors for flagship smartphones, wearables, LG OLED TVs, soundbar and home appliances. Huawei’s very own official Android application distribution platform, the Huawei AppGallery, recently made its debut at the KL Level Up 2018, further firming its presence in the Malaysian market with the rise of Huawei smartphone users. Anchored on the theme “Beyond Entertainment”, the annual Southeast Asia games event was led by Malaysia Digital Economy Corporation (MDEC) with an aim to grow the games industry as Malaysia continues to be one of the biggest and fastest growing market in Southeast Asia. 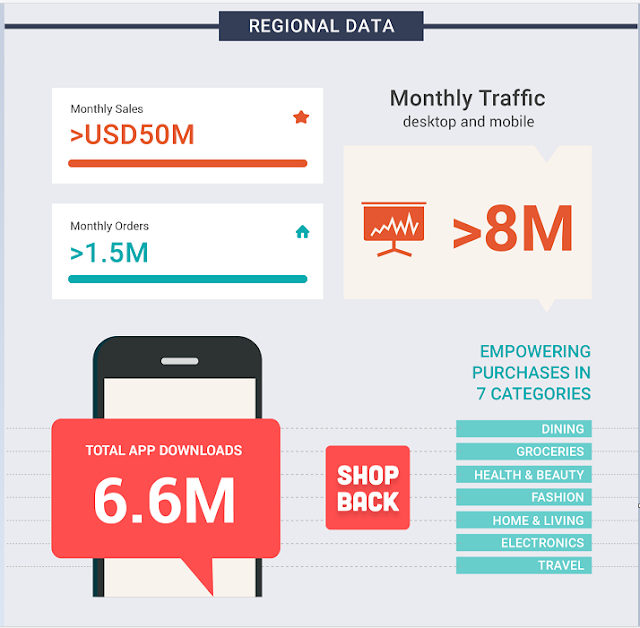 With thousands of games on board, gaming is one of Huawei AppGallery’s top category. Fresh from the oven, AppGallery just launched the latest games for the month of November featuring Vainglory 5v5an, the highly-rated MOBA (Multiplayer Online Battle Arena) game to thrill fans. Western Digital Corporation (NASDAQ: WDC),announced the new Ultrastar® DC ME200 Memory Extension Drive is the company’s first product that enables customers to better optimize in-memory system capacity/performance for running demanding applications that drive today’s real-time analytics and business insights. The year end festive mood has already begun and Jabra, the sound solution specialist is happy to reward its customers with amazing prizes. What better way than with a smartphone to pair with awesome audio! It takes two to tango - so here goes! Bacon is perfect with eggs and coffee goes well with cake! Now awesome audio “tangos” nicely with cutting edge smartphones. And what better audio experience than from renowned sound specialist, Jabra who will be rewarding its loyal customers with a range of smartphone prizes worth up to RM20,000. Digi Telecommunications Sdn Bhd (Digi) today announced the launch of Digi Stepz, a wellness pilot programme that allows Malaysians to stay fit by measuring their average daily steps through fitness wearables and, the best part be rewarded for staying active. The programme, in partnership with insurance provider AXA AFFIN Life, online healthcare solution provider and reward partners, BookDoc as well as lifestyle management application provider, Naluri, is open to all Malaysians between the ages of 18 and 39, where participants can enjoy rewards and cashbacks from various merchants based on the accumulation of their daily steps. 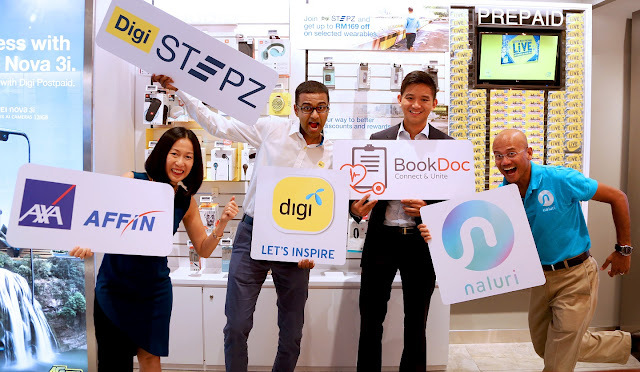 Launch of Digi Stepz: From left to right: AXA AFFIN Life’s Chief Customer Experience Officer (CCXO) GG Kam, Digi Chief Digital Officer Praveen Rajan, BookDoc Founder and Chief Executive Officer, Dato Chevy Beh and Naluri Founder and Chief Executive Officer, Azran Osman-Rani. Digi Stepz is a wellness pilot programme that encourages Malaysians from all walks of life to lead a healthier lifestyle by staying fit and healthy. The programme aims to encourage Malaysians from all walks of life to lead a healthier lifestyle by staying fit and healthy. Digi Stepz runs for a month-long period beginning from 3 November until 2 December 2018 at all participating Digi Stores in Klang Valley. VMware, a leading innovator in enterprise software, unveiled new capabilities to its intelligence-driven VMware Workspace ONE platform at VMworld 2018 Europe earlier this week. These include providing modern management and security advancements for customers’ heterogeneous environments as well as richer employee experiences across more apps and devices. As more organizations take up a Bring Your Own Device (BYOD) strategy and employees turn to multiple devices, OSes, services and apps to work in the manner that suits them best, embracing technology heterogeneity across the Workspace ONE platform will help organizations reduce IT costs and complexity, automate management and security and provide a better employee experience. 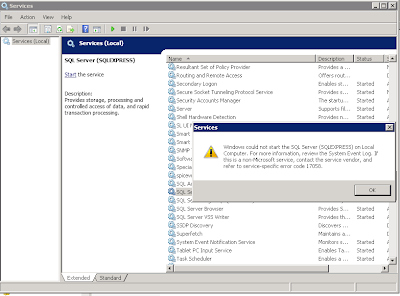 Separately, VMware also announced a new release of its integrated hybrid cloud offering to help customers more easily deploy and operate across hybrid and multi-cloud environments. With VMware Cloud Foundation 3.5, customers will gain access to greater deployment options, new Kubernetes support, and the latest innovations from VMware’s leading infrastructure and management portfolio. 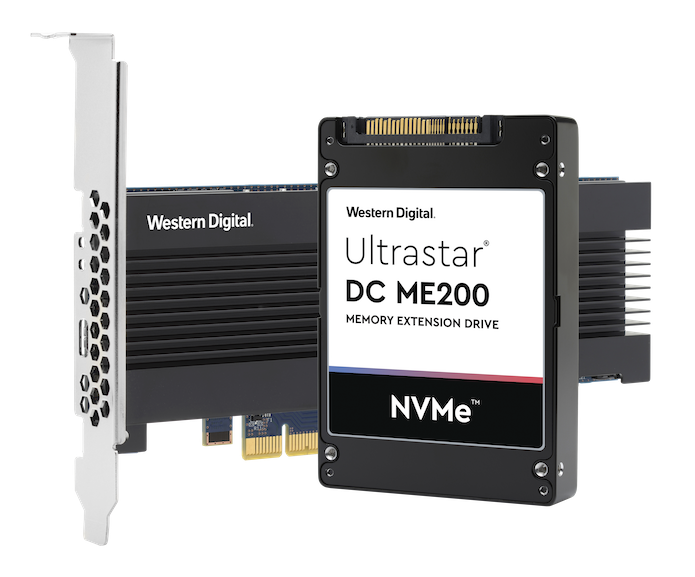 It offers the fastest way for customers to build an integrated hybrid cloud by delivering a comprehensive set of software-defined services for compute, storage, networking, security, and cloud management to run enterprise applications in hybrid cloud environments. Malaysia, when the clocks ticks 00.00am on 11.11.2018, thousands of shoppers rush to check out their items online and ShopBack Malaysia witnessed an immediate traffic spike online - at least 10 times - comparing to normal days. As the largest Cashback platform in Malaysia, ShopBack has been assisting shoppers to buy their items using the cheapeast way possible via giving out cashback - in hard cold cash form which shoppers can save the money into their bank account. Besides Alibaba’s group Taobao, Tmall and AliExpress, all other popular sites like Lazada, 11street, ZALORA, Booking.com, Expedia, Fave, Hermo, etc are working with ShopBack to boost their sales since 2015, especially during huge campaign like 11.11 Global Shopping Festival. Shopee Malaysia also come onboard to offer up to 6% of cashback to ShopBack users, starting from 7pm yesterday. In the future, cyberattackers may be able to exploit memory implants to steal, spy on, alter or control human memories. Scientists are learning how memories are created in the brain and can be targeted, restored and enhanced using such implantable devices. However, vulnerabilities exist in the connected software and hardware and these need to be addressed if we are to be ready for the threats that lie ahead, according to a new report by researchers from Kaspersky Lab and the University of Oxford Functional Neurosurgery Group. Design constraints as patient safety takes precedence over security.